(Photo credit: Tom Casino/Showtime) By William Mackay: Former IBF/WBA light welterweight champion Amir Khan came out of the woodwork earlier today to comment on Lucas Matthysse (32-2, 30 KO’s) in his twitter page. As far as Matthysse’s loss to Judah goes the fight took place in November 2010, and Matthysse dominated the last eight rounds of the fight after getting off to a slow start in the four rounds. Judah was given a 12 round split decision, but few people agreed with that result. I had Matthysee winning the fight handily. It wasn’t even close. He knocked Judah down in the 10th and swept rounds five through twelve on my scorecard. Granted, Matthysse didn’t do as well as Khan did in beating Judah by a 5th round stoppage in July of last year, but then against Matthysse didn’t hold Judah down with his left hand while tagging him on the belt line like Khan did in getting the stoppage. That knockout should have been waived off, but it looked the referee working the fight was shielded from seeing how Khan was holding Judah’s head down with his left arm while hitting him with his right. I don’t think Khan would have lasted more than four rounds against Matthysse last night. The shots that Matthysse was hitting Ajose with would have likely had Khan knocked out many times in the fight. I just can’t see Khan lasting long against a quality fighter like Matthysse. I’m sure Matthysse would jump at the chance to fight Khan if it were offered to him by Golden Boy Promotions. It won’t be, though. Khan probably isn’t going to fight anyone dangerous like Matthysse anytime soon, if ever. 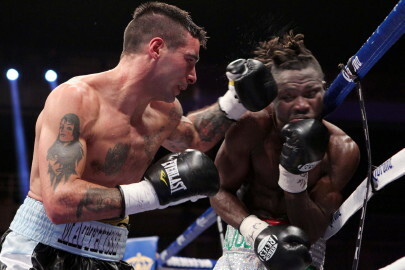 Last night, the 29-year-old Matthysse looked really impressive in stopping #1 WBC Olusegun Ajose (30-1, 14 KO’s) by a 10th round TKO to capture the vacant WBC interim light welterweight title at the Hard Rock Hotel and Casino, in Las Vegas, Nevada. Matthysse totally dominated a very good fighter in Ajose and made it look easy in punishing him every step of the way.